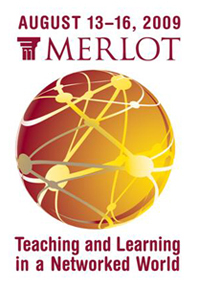 The planning committee has been gearing up for the MERLOT International Conference in San Jose, California, August 13-16, Teaching and Learning in a Networked World. Our keynoters: John Wilbanks from Creative Commons; Wade Ellis, representing our featured disciplines, Math and Statistics; and Carl Berger, an old friend of the MERLOT community, will wow you each morning at the plenary sessions. Additionally, you’ll find a variety of sessions geared toward faculty members, administrators, librarians, professional developers and others in the K-12 to higher education communities. The MIC is a great place to network, both figuratively and literally. We are looking forward to exciting pre-conference sessions as well as a host of workshops, presentations, and learning circles that will encourage you to think about technology and its impact on learning. Be sure to register for the conference at http://conference.merlot.org/2009/registration.html. You can access information about hotel and travel arrangements at http://conference.merlot.org/2009/hotelandtravel.html.